The B2B Marketing Expo, year after year, Europe’s most proactive marketing and sales professionals descend on the ExCeL, all hungry to find the tips, techniques, innovations and strategies they need to transform themselves and their companies into the biggest names within their respective fields. Visitors have increased dramatically, hitting an incredible record of over 15,000 in 2018. This is an incredible opportunity not only to find over 1,000 of Europe’s top suppliers all under one roof but also to take advantage of free consultations and demonstrations of the products that will provide your marketing team with that crucial competitive edge. A plethora of the industry’s most successful names will be on hand to deliver all the how’s what’s and why’s, on their ascension to the forefront of the marketing sector. There will be speakers from lots of different industries and businesses, including our very own CEO, Michael Carlin. Keep reading until the end of this blog to find out where and when he’ll be hosting his talk. 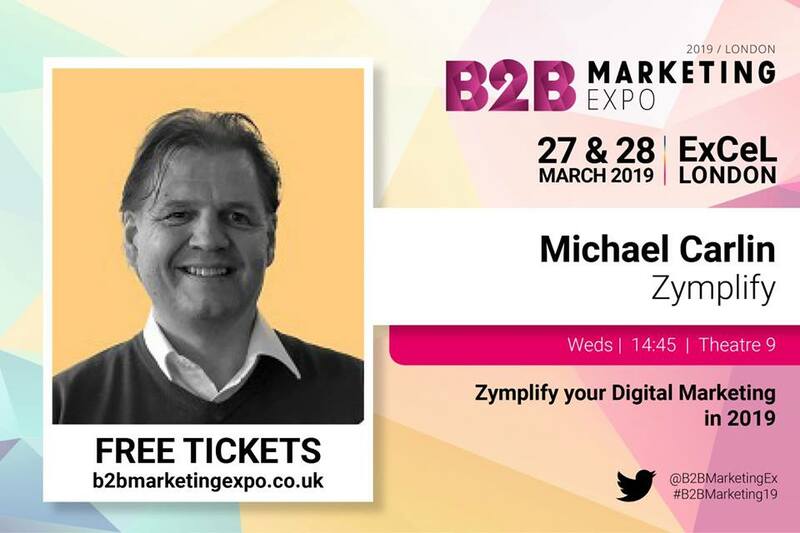 In an industry characterised by fierce competition and constant technological advancement, the B2B Marketing Expo presents a hub from which exhibitors, speakers and suppliers are on hand to provide invaluable industry insights, all under one roof, over just two unmissable days! This is THE most efficient way to stay ahead of your competition, while consulting the industry’s leading minds and preparing yourself for any future challenge, absolutely free of charge. You probably know something about us if you’re already on our blog, but for those who are new around here, let us introduce ourselves. Zymplify is an automated sales and marketing automation platform designed to help SMEs and Digital Agencies grow their business, fast with the use of effective and highly-targeted multi-channel marketing. Marketers can manage and analyse all their marketing efforts from one easy-to-use platform. We’re the fastest growing European based marketing automation vendor, now lives in state-of-the-art offices in Portstewart and Belfast in Northern Ireland, London as well as US headquarters in Boston, MA, where we house our fast-growing team of marketing, business and tech professionals. We’re also delighted to announce we are nominated for the Best Marketing Management Tool at the expo next week. We’re so proud of where we have come in such a short space of time and we can’t wait to show you what we have to offer in 2019. The idea for Zymplify came from Michael 5 years ago when he couldn’t find a solution to his problems. After a career in international finance at the insurance giant, AIG, Michael returned home to Northern Ireland, with a goal the goal of setting up his own business. He could see that digital marketing was becoming a way of life for businesses of all sizes and that those offerings needed to be available as Software as a Service (SaaS), be easy to use, reasonably priced and be built with the latest in leading-edge technology. The expo will take place on Wednesday 27th and Thursday 28th 2019 in the ExCeL, London. If you’re attending the expo on Wednesday, Michael will be speaking in Theatre 9, from 14:45 until 15:15. He’ll be chatting all about the digital marketing landscape in 2019 – come along and say hi! We’d love to meet you all. For more information, check out the B2B Marketing Expo website here.